If you are reading this page it is most likely because you are supposed to come and see our lab at Imperial College London. The lab is located in the Sir Ernst Chain (SEC) / Wolfson Building on the South Kensington Campus. Be aware that the building was known as Biochemistry Building until not so long ago and some people may still refer to it by the old name. If you are using public transports, take the tube to South Kensington Station (District, Circle or Piccadilly line). Take the exit North (i.e. on your right as you climb the stairs), and walk through Exhibition Road towards the Museums / Hyde Park. 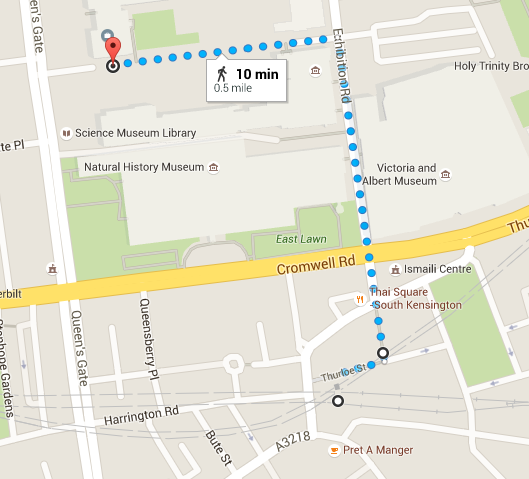 Immediately after the Science Museum, take a left turn and enter Imperial College Campus. The Queen Tower and Queen’s Lawn will be on your right, the Library in front of the lawn. The Biochemistry building is the last glass building on the left-hand side, just before the gate on the other side of the yard. Enter the building and ask the receptionist to call Giorgio. The office is on the fourth floor (room 408) and the phone extension is 45443. Full signature / contact details. N.B. : Shipping address for parcels is here, and slightly different.